Each year the National Agricultural Statistics Service of the USDA releases estimated average farm real estate values by state. The estimates are based on surveys of farmers from selected geographical areas. The surveys follow strict statistical guidelines. Estimated values maybe revised the following year based on additional information. Revisions may also be made based on data from the 5-year Census of Agriculture. The methodology and timing of the study has changed over time but the statistical information provides some insight as to the changes in farm real estate values from year to year. 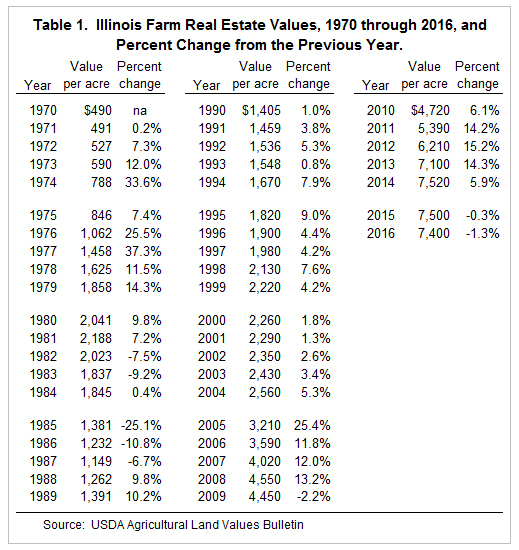 The average Illinois farm real estate values from 1970 through 2016 are listed in Table 1 and graphically in Figure 1. 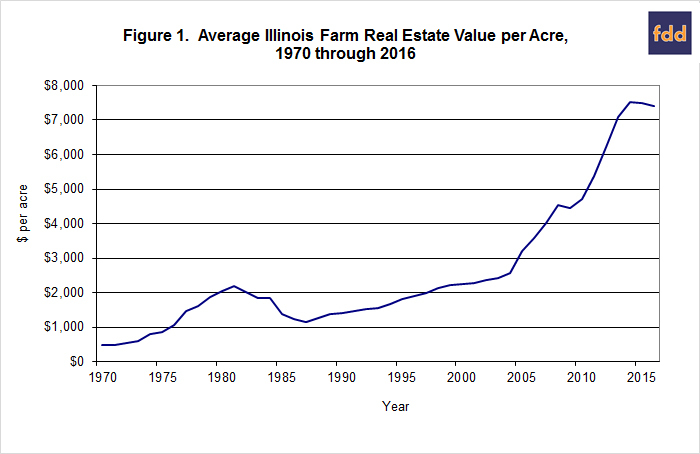 The average farm real estate value for Illinois in 2016 was $7,400 per acre. This includes the value of all land and buildings. The figure was 1.3 percent lower than the 2015 average of $7,500 per acre. The 2016 decrease is the second since 2009 and only the third decrease since 1987. Even with the slight decrease in 2016, Illinois farm real estate values have increased 19 percent in five years and 84 percent in 10 years. Since 1970, average farm real estate values have declined only eight times as compared to the previous year. Those years were 1982, 1983, 1985, 1986, 1987, 2009, 2015 and 2016. The last time there were two years in a row with a decrease was 1986 and 1987, however the decreases in 2015 and 2016 were very small compared to those years. There have been four years when farm real estate values increased over 20 percent, in 1974, 1976, 1977 and 2005. The largest increase was in 1977 when values rose 37.3 percent. From 1995 through 1999, average farm real estate values increased between 4.2% and 9% annually. From 2000 to 2004, farm real estate increased between 1.3% and 5.3%. From 2005 to 2009 the change in average farm real estate values had ranged from -2.2% to 25.4%. From 2010 to 2014, the increase in farmland values has averaged 11.1%.